CNG: eAuction 438. GERMANIA INFERIOR. Æ Sestertius (38mm, 24.72 g). Countermark applied during the reign of Nero, AD 54-68 or Titus, AD 79-81. 438, Lot: 332. Estimate $100. GERMANIA INFERIOR. Æ Sestertius (38mm, 24.72 g). Countermark applied during the reign of Nero, AD 54-68 or Titus, AD 79-81. 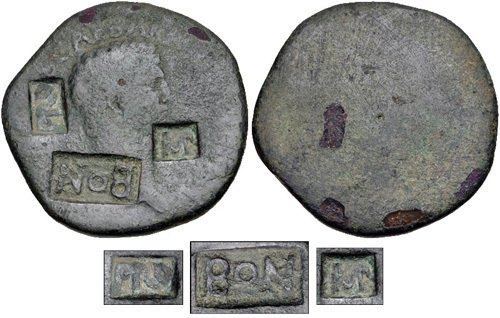 BON, PRO, and (IMP) in three rectangular countermarks on a sestertius of Claudius. Pangerl 42, 47, and 48. Host Fair, c/m’s VF, dark green patina. From the Richard Baker Collection, purchased from Alex G. Malloy, late 1980s.